My wife and I live in the country in Wayne County in northeast Ohio, and enjoy the sights and sounds of wild-life. Coyotes provide their weird series of moans, whistles, yips, and howls – truly cool. 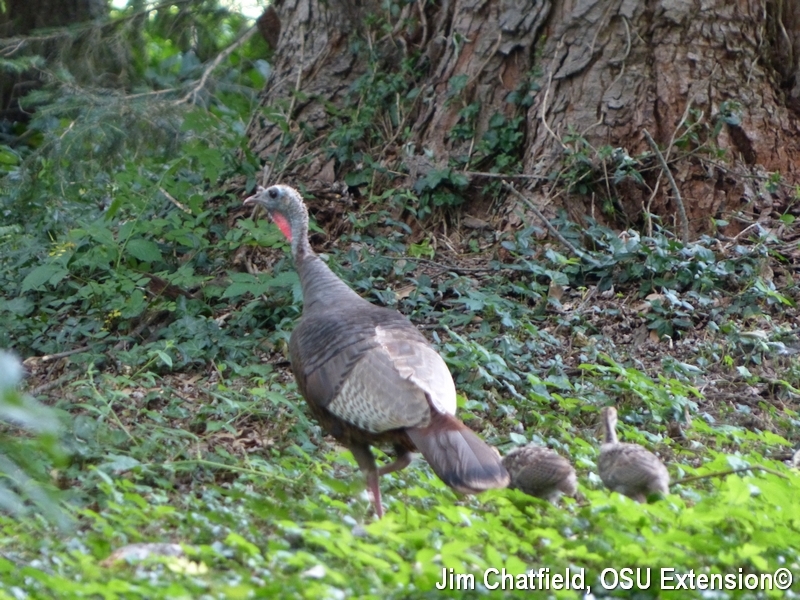 Equally cool we have a turkey (Meleagris gallopavo) hen and two poults that waltz through our yard periodically this summer. This is much to our delight, except for areas of the lawn (such as it is with our dry period this summer) that they ruffle up, presumably in their omnivorous belief that “We Have The Meat” (insects and millipedes) and vegetables (acorns, roots, almost everything else). Then at dusk last Wednesday cousin Nicola, visiting from Portland for my daughter’s wedding, noticed that the turkeys were hanging out in the large silver maple tree in our front yard. Maybe 50 feet up in the maple tree! Perhaps everyone else in the world knew this save me (actually my informal polling this past week is about 50-50), but I had no idea that turkeys have arrived at the obviously successful evolutionary gambit of sleeping the night away safely way up trees above their predators. I seem to remember that when encountering wild turkeys in the woods they frantically bulldozed their way through the brush. It never occurred to me that they are powerfully fast fliers as well as track-star sprinters on the ground. Now I am a true turkey… enthusiast.